This video offers the vantage point of a 13-year-old as he and his family take actions to reduce energy consumption in their own home. It explains how a net-zeo home works and includes information about energy efficiency in the home. Comments from expert scientist: They mentioned their ability to reduce their energy use by 50%, which is important. In my experience, most homeowners can do this. Background information, discussion questions, and a printed transcript accompany the video segment. 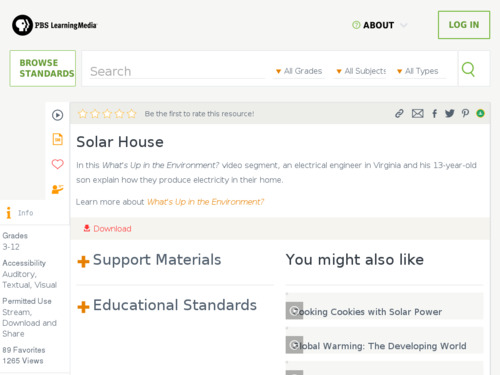 Additional links to learn more about energy are provided in the background information. Students may relate to the age of the boy narrating the video and might be encouraged to discuss with their parents how they can make changes in their own homes. When viewing online, the full-screen mode is pixilated. A high-resolution version can be downloaded.